No smoking. And soon, no drinking and no talking! You have to give it to the man who wrote this. 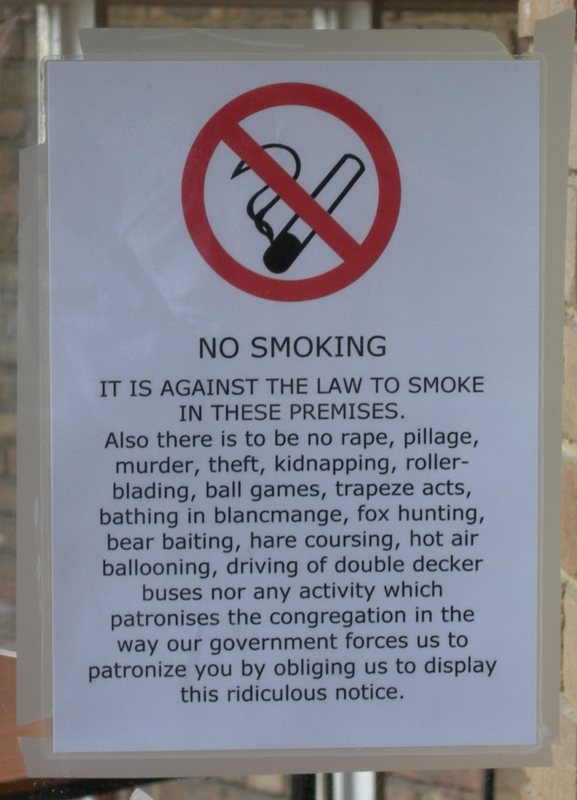 I still remember laughing at Eddie Izzard’s little piece on the smoking ban in California. Smoking bans have since then proliferated to such a state, that the Pacific island of Niue is intending to ban smoking altogether. And fair play to them. One wonders how long down the line before such a blanket ban appears in some larger nations. Smoking is essentially acceptable, despite the decades spent fighting it, and an outright ban would appear to be the only logical conclusion. Whilst opinions based on fact can cause uproarious controversy in the world of drugs, alcohol and tobacco remain relatively immune. But every step towards removing tobacco from the public light is a step towards the ban which will put tobacco in with cannabis and LSD. Perhaps then we will see an end to these rediculous signs, and churches can go back to focusing on telling people to stop begrudging their neighbour’s donkey.